The theft of Impressionist paintings in Switzerland has made news lately. In fact, it has caused the insurance on art exhibitions to go up for museums around the world (like the museum where I work). 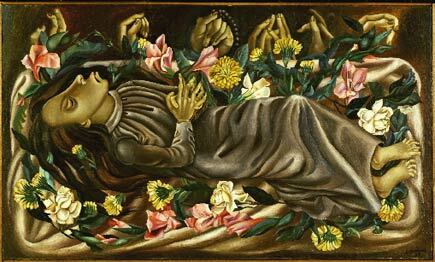 But Mexico still holds the distinction for one of the most spectacular art heists. 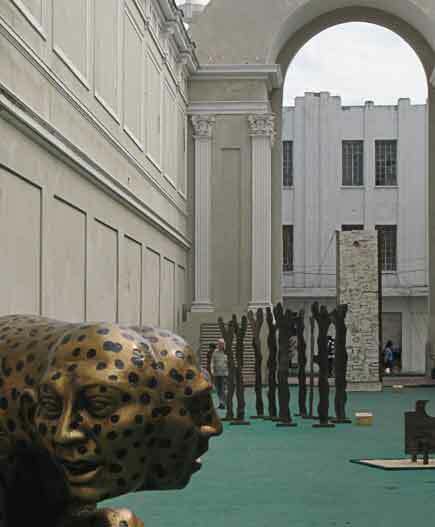 In 1985 thieves made off with 140 objects from the National Museum of Anthropology in Mexico City. To my knowledge, this is the largest number of objects ever stolen from a museum. The theft occurred on Christmas day. There were eight guards on duty, but they don’t seem to have been very vigilant. And the museum’s alarm system had been broken for the past three years. The objects — Maya, Aztec, Zapotec, and Miztec ceramics mainly — were small, but extremely valuable. One of them alone (a monkey-shaped vase) was valued at $20 million. I never heard whether any of the objects was recovered. 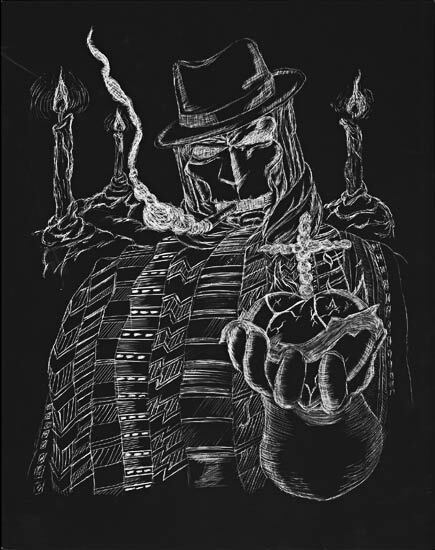 This Maximon image was created on scratchboard by student artist Edwin Harris, Jr., of Georgia. On his blog he gives a little background on the process. Arte Maya Tz’utuhil is a one-man business of Joe Johnston, based in San Francisco. 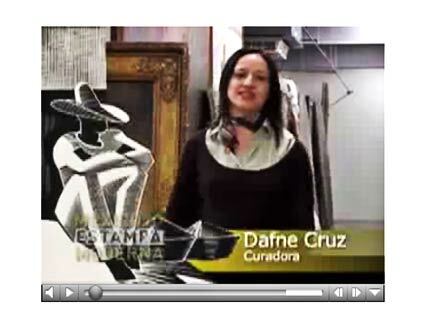 Its website is www.artemaya.com. Johnson travels to Guatemala once or twice a year to acquire paintings — mainly from artists in the Lake Atitlan area — for representation for sale. 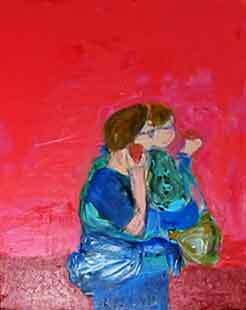 The website offers a wide range of painting (and calendars), from relatively inexpensive pieces to more substantial works, such as this large oil painting. Shown is Recorriendo Camino al Mercado (Traversing the Road to the Market) by Mario Gonzalez Chavajay, 2003, oil on canvas, 36 x 56 in. 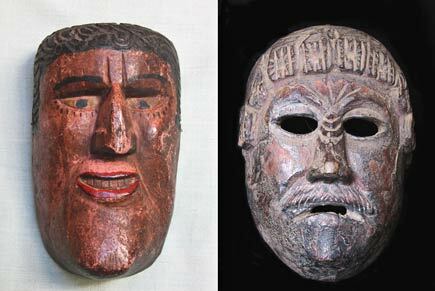 El Curandero Gallery, located in La Antigua, Guatemala, looks like a good source for Guatemalan masks, wooden figures, slingshots, ceramics, paintings, and textiles. Among their current listings are these two Maximon masks. The one on the left dates from the 1950s and the other from the 1940s. Maximon is an auspicious folk deity best known from his cult at Santiago Atitlan. He apparently blends aspects of the Christian Saint Simon with a Mayan god, perhaps Maam, an underworld god. 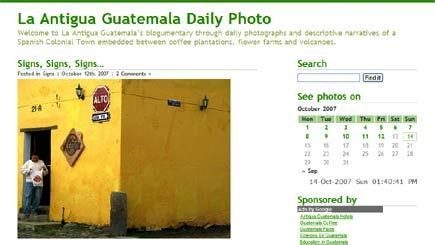 I photographed a Maximon altar in Antigua a few years ago, and posted information about Maximon on that page. I took the picture above at the MACAY in February. 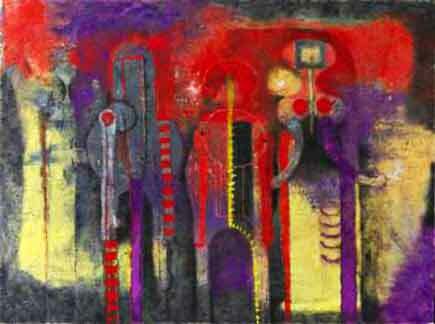 While we’re on the subject of Rufino Tamayo paintings, I should mention, in case you haven’t heard, this story. It seems not everyone is a fan of brightly colored abstraction. At any rate, someone threw Tamayo’s 1970 painting Tres Personajes into the trash. 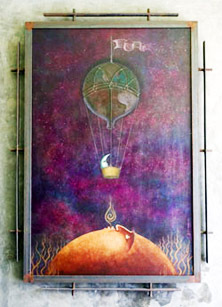 The painting had been stolen from its owner in 1987. Nothing was heard of it for years, until in 2003 it was found on a New York City curb. Eventually the work was sold at auction for more than $1 million. 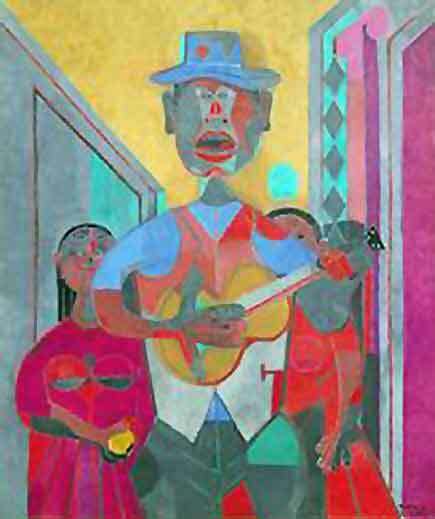 Mexican artist Rufino Tamayo’s Trovador (Troubador) has been removed from a Christie’s auction after fans of the painting filed a lawsuit challenging the work’s sale by Randolph College. 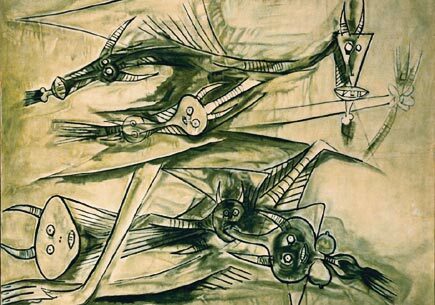 The painting was to be the “crown jewel” of the Latin American-focused auction, in which twelve sales records were broken, as 65 items sold for 21.6 million dollars. Trovador was expected to fetch a price of as much as $3 million. 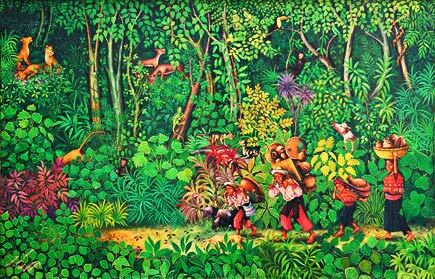 Yucatan Living has a nice article on the Merida-based painter Samuel Barrera. 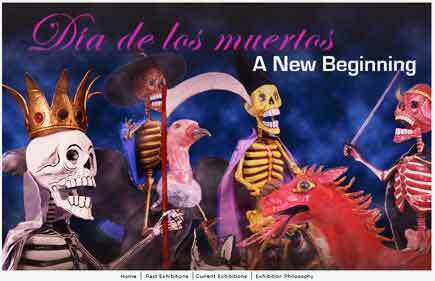 Trained in law, Barrera developed a passion for painting while designing and creating theater sets. 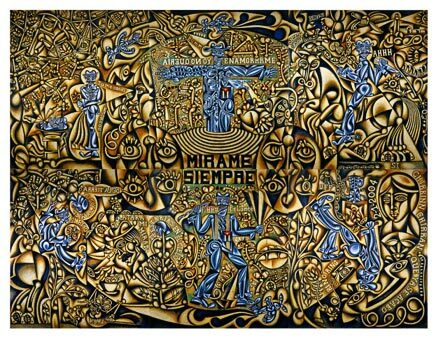 After years of struggle, most recently selling his art in the Parque de la Madre outside of the Jose Peon Contreras Theatre, Barrera seems to be breaking through, with several gallery exhibitions coming up. His canvases are often displayed in iron frames, like the example shown here. The relief appears to depict a standing female ruler. A snake wraps around her body, and out of its head appears the deity K’awil. This is the iconography of the vision serpent. Dates on the sculpture give the dates March 13, 761, and August 10, 760. Both the dates and the style suggest an origin in the southern Maya lowlands. In every civilization of the ancient world, there are art works and monuments that stand out among their fellows as objects of special character. The great portrait sculptures that stand in silent rows down the center of the Great Plaza of copan created one of these special places. 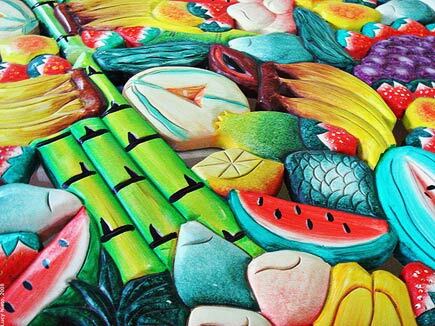 They constitute one of the great masterpieces of the Maya legacy. 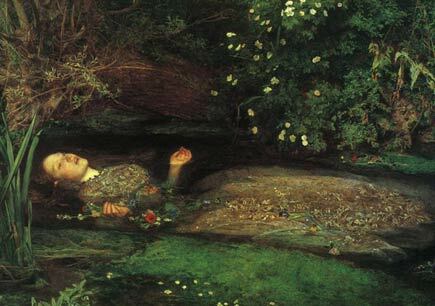 Although the artists who made them did not sign their works and leave us their names, the patron of these great works did. He was Waxaklahun-Ubah-K’awil (commonly known as 18 Rabbit), the thirteenth king of the Copan dynasty. 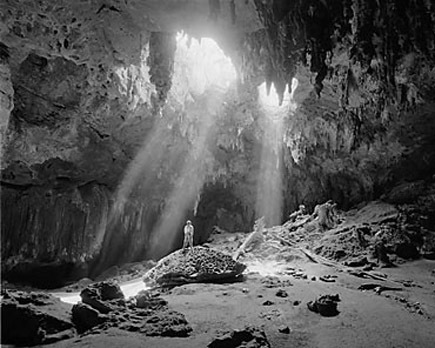 The trend in Maya archaeology has been away from architectural and fine arts connoisseurship and toward broader societal analysis, with new work focusing less on the grand monuments of the ruling elite than was the case in the past. A working archaeologist in the Maya area today is more likely to be sifting dirt for fragments of fish and animal bones than reconstructing a soaring temple overgrown with vegetation. 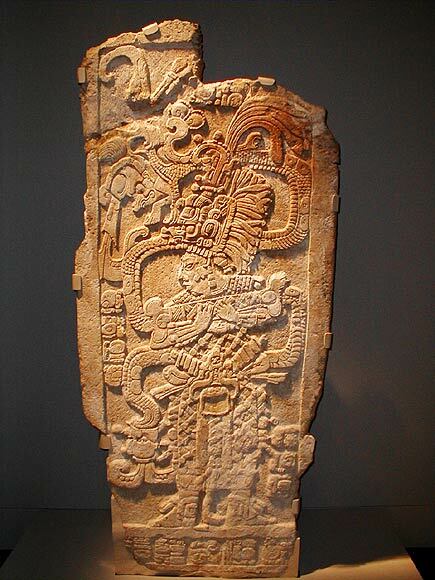 But some achievements are too great to be resisted, and the stelae at Copan are among them. Waxaklahun (whose name actually alludes not to a rabbit but to a War Serpent) assumed the thrown of Copan on July 19, 695, when the city was at the height of its power. He soon oversaw a prodigious program of construction of public monuments. 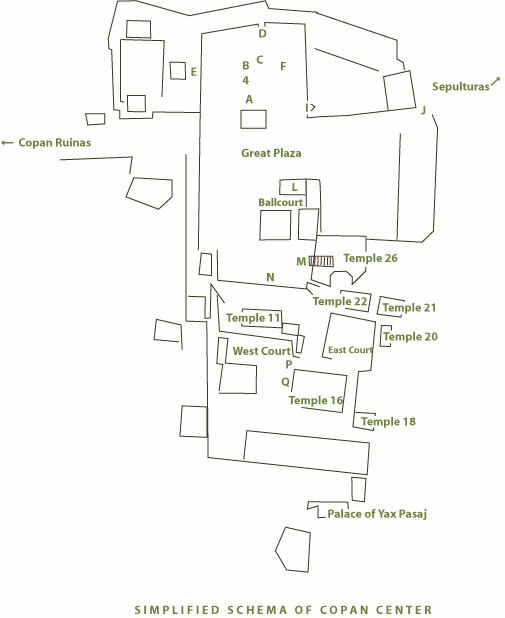 His projects included Temple 22, a remodel of the ball court, and the initiation of work on the hieroglyphic stairs of temple 26, perhaps Copan’s most famous feature (see map). And, over a period of years, he filled the Great Plaza with a major series of stelae. The stelae are in at least a couple of different styles. It was once thought that these styles relected an evolving artistic aesthetic, but we now know, from their inscriptions, that the historical sequence of the works does not correspond to the stylistic differences. Schele and Mathews suggest instead that the stelae were the works of two different artists (or workshops), one more “innovative,” producing works more fully in the round, and the other more “conservative” (traditional), producing works emphasizing shallower front and back reliefs. Stela B is an example of the latter style. At the time of its construction (August 22, 731) the planet Venus appeared in the constellation Virgo, which the Maya associated with Chak, the rain god. The stela depicts Waxaklahun bedecked with the diadem of Chak in his headdress, and further allusions to Chak in his elaborate regal regalia. The stela formidably expresses the king’s royal authority and his association with Copan’s patron deities (complex allusions to the Macaw Mountain Lord are prominent on the reverse side). Five years later, around the time Waxaklahun — now an old man who had reigned more than forty years — erected his last stela (Stela D) in 736, a representative of the Maya state of Kalakmul met with K’ak’-Tiliw, the vigorous, youthful ruler of Quirigua, a vassel state to Copan. 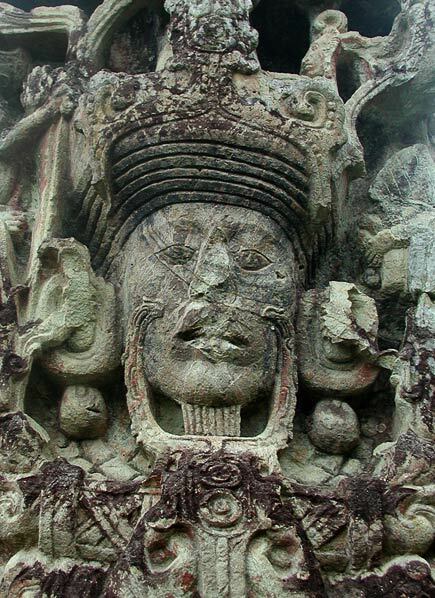 Kalamul was an emerging power and the enemy of Copan’s trade partner, Tikal. 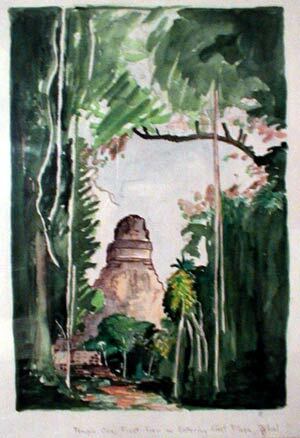 Copan, though at the extreme southern limit of the Maya region, occupied a strategic position that offered the possibility of controlling trade in jade and obsidian through the Motogua valley. About a year after this portentous meeting, K’ak’-Tiliw attacked and defeated Waxaklahun. In the fighting the mighty patron of the Copan’s Great Plaza stelae was captured. Waxaklahun was sacrificed to the gods in the Great Plaza of Quirigua. As he attended his priestly executioner he must seen that K’ak’-Tiliw’s monuments were not so fine as his own.